Description of "Happiness ki Khoj"
You've this subtle feeling that you are happy but you also feel the potential to be a lot happier. But you don’t know how to unleash this untapped potential within you. This book shows you how not to settle for just being happy but learn the art to celebrate life, right here, right now! First section helps you understand four kinds of happiness, debunks common myths around it and explains what real happiness is. Second section deals with styles of parenting especially motherhood and which one is right for you. You will learn happiness habits of highly Happy Moms that leads to a Happy Child. It covers real stories of ordinary Indian women who share their happiness secrets to lead extraordinarily happy life. Third section covers factors that affects your daily happiness - friendship, health, success, work, money and recognition. It paves a clear path for you to follow in each of these areas to elevate your happiness levels. 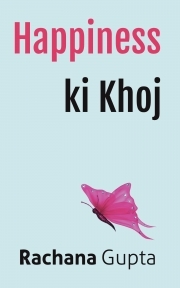 Rachana is a Happiness Coach and Author of the book - Happiness ki Khoj. Rachana bid adieu to a successful 16-year corporate career to pursue her dream of enabling people to experience real happiness and celebrate life, here, now! She has established her secrets of real happiness in three ways – personal experiences, deep observations of social behaviors and extensive scientific research around the world. She has made a life-long commitment to share these secrets with people especially moms. She believes that a happy mom leads to a happy child giving rise of happier generations ahead. Rachana loves to interact with people and make a life-changing impact in their lives. Reviews of "Happiness ki Khoj"